It's astonishing how quickly Saturdays seem to roll around. I've no sooner read everyone's Sixes than it's time to prepare another one of my own. Six on Saturday is hosted by The Propagator. Participants are invited to show six things from their garden: flowers or vegetables, trees or shrubs, paths or gardens, successes or failures. Six things. From a garden. Don't forget to drop in to The Propagator's blog to catch up on what other gardeners are doing. Since last week the weather here has been glorious. Cold in the mornings, yes, but the days have been full of sunshine. People are still wearing shorts! Wonderful weather for gardening. 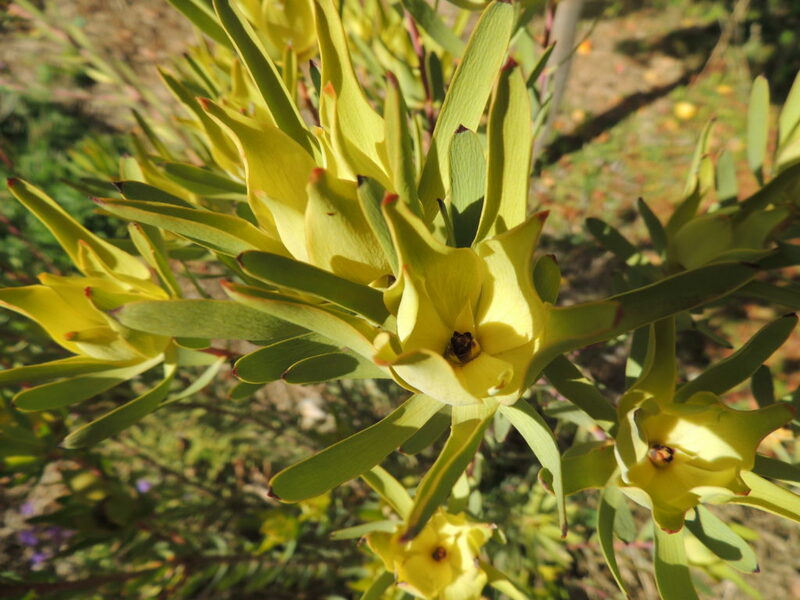 Leucodendron salignum. The label describes it as 'Red Devil' but something tells me this plant is wrongly labelled! 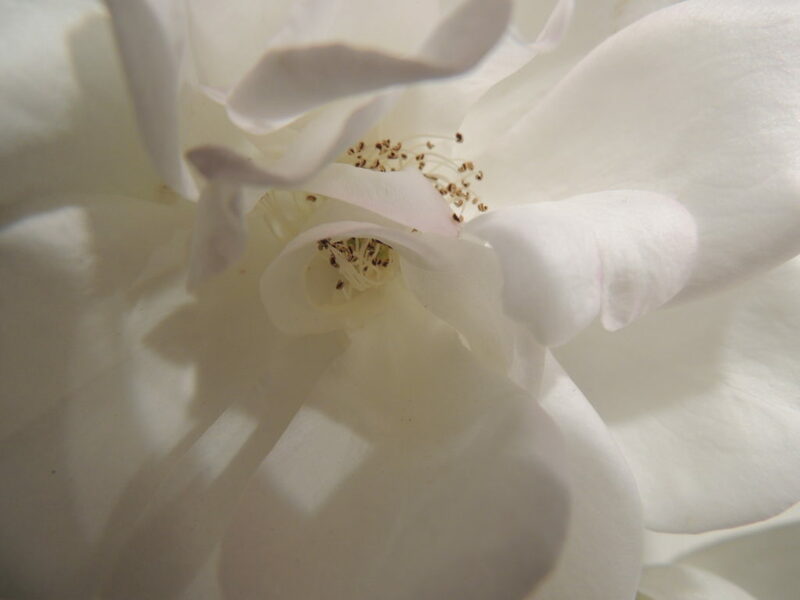 The second picture is a different view of an older flower on the same shrub. Various websites tell me it must have plenty of sun or the flowers won't colour. Well, sun is something it's had in abundance, so my guess is an incorrect label. 2. Last of the Iceberg roses. They will flower sporadically until they're pruned in July, but I'm not expecting too much more from them. 3. A garden view. The two poor bay trees on each side of the steps have been in those pots for at least five years. They are very sulky, and who would blame them? They're going to be released from their misery next week, all going according to plan, and planted in the ground. 4. An iris flowered! It was the only one, and who could possibly guess that this would happen? Its time with us was fleeting: in two days it was finished. There will be more of course, but not for a while. 5. Crepe Myrtle. Unlike last week's crepe myrtle, this one is a shrub which was given to us as a house-warming present. I don't know its name as it began as a cutting from the friend's garden. It's looking rather autumnal with its tiara of berries. 6. 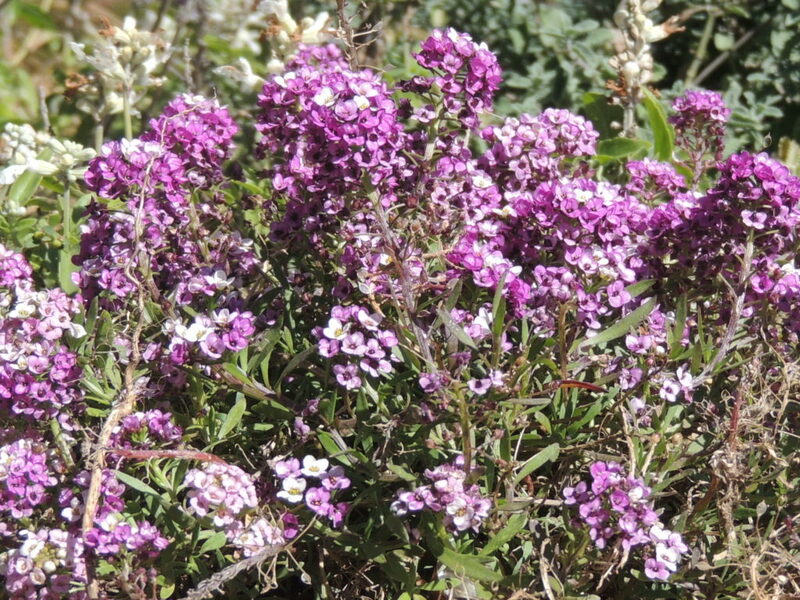 This week's unsung heroine is Alyssum, (it was Lobelia last week, you may remember), another flower that will brighten our garden during winter with splashes of pink, mauve, apricot, purple and white. There’s even a yellow one, although I have never seen it. Alyssum self seeds readily, filling small spaces in a very obliging manner. Weather today: 0 -19 degrees C and sunny. Of course! The iris must have thought it was Spring! Yes, I was bemused by its sudden appearance, Tracy! Most unusual and interesting 6. I have 2 bay trees beside a bench which are doing well but won’t need transplanting or repotting for a while. I bought a pot with at least 8 tiny twigs of bay few years ago for a couple of pounds (I may have mentioned this) and I reckon I have at least £40 now – the price of an established bay is ridiculous here! Anyway, I must stop reading all the Sixes as they come in…… there is gardening to be done and the sun is shining! Luckily for me the sixes are at night! They do take up quite a lot of time don’t they? They make very interesting reading, though. 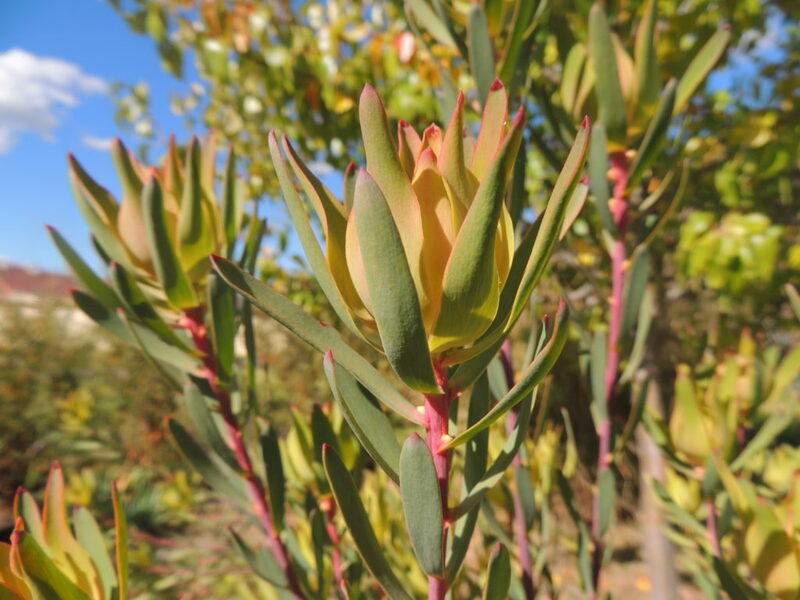 Good or bad labeling, Leucadendron Salignum is very pretty. It’s true that these flowers are not as colorful as other items in your post but they are surprising. My crepe myrtle is not so far ahead of yours. Still a few weeks(months..) to wait. But Fred, your crepe myrtle must be getting ready to come into flower, while mine is losing its leaves and becoming dormant. 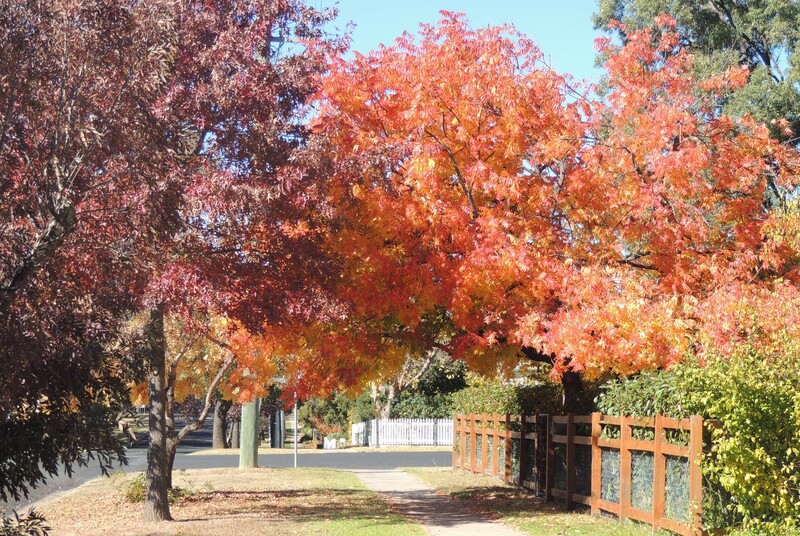 Please don’t plant Bay trees out – they send up multiple suckers, which can also grow into trees and it’s impossible to get rid of the suckers once they’ve spread. I sprained my wrist early last year trying to cut the suckers out. Oh dear, Ann, now I am in a quandary! My Icebergs are just coming into flower right now! Hopefully they will bloom as long as yours have and I can post about them in late Autumn. They will Tim. They’re very reliable. I had a small bay (Laurus nobilis – the best culinary variety) in a large pot outside the kitchen door. Like you I decided to let it loose in the ground. It is now some five feet across and I prune it down to the same height five or six times a year; I’ve managed to stop it spreading further! The local pub-come-restaurant relieves me of some of the prunings in exchange for a pint or two. Well, saves me carting them off to the recycling centre. I’d think carefully before planting yours out. Hello John, thank you for your advice (and warning) about bay trees. I’m unsure what to do now. I was quite excited about planting the trees out after I saw them in the ground at Lambley Gardens and trained into a round shape. I thought they looked very good. We don’t get as much rain as you, obviously. Perhaps that might slow the growth down. Yes Pauline, the mulch might inhibit the growth, although I’m sure you get more rain than we do. I’ve done the same thing myself with mulch and I feel I don’t see as much growth as I might. Damned if you do and damned if you don’t! What a lovely display of colour. The sunshine looks glorious. Alyssum has to be one of my favourite ground covers and the scent is so sweet. Hi Vicki, white alyssum would certainly look pretty with lobelia. Thank goodness the harlequin bugs have disappeared. You have a lovely garden. The iceberg roses remind me of South Africa where they were very popular on the vineyards and citrus farms. No smell though. I do like my roses to have perfume. Thank you, Jude. 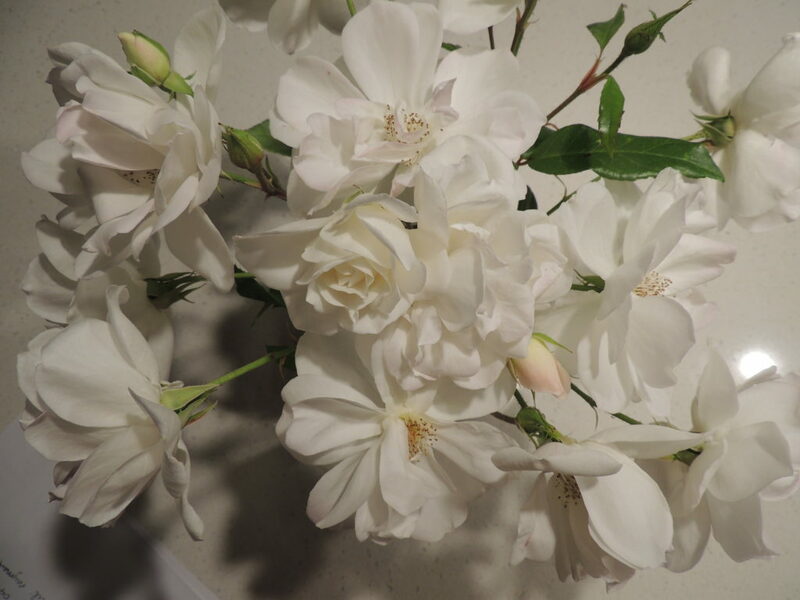 Iceberg roses are considered to be a bit common, I think, but I like them because they flower continuously from October until May and require very little effort. I only have two, which I inherited. Thank you Gill. The garden lacks a bit in the way of a canopy- I have to be patient- but it’s coming along. The autumn colours in that first shot are stunning! They are, aren’t they. Not part of my garden sadly, but a street scene from the town. I’m very fond of Alyssum myself – it and Erigeron kavinskianus are the most obliging fillers in my garden. I also value Leucadendon salignum and have several, the largest of which is ‘Chief’, a specimen I was just admiring this morning. Enjoy your pleasant weather in the garden, Jane! I have erigeron as well, Kris, and it’s a good filler too. I did a quick search on ‘Chief’- he’s quite magnificent. Oh Jane, your first photo of the autumnal colour is simply glorious. It is gorgeous, isn’t it. Sadly, it isn’t part of my garden, but in one of the streets. The Autumn colours have been fabulous this year. Your photos of autumn colours are stunning, Jane – how lovely to have the sunshine to light everything up like that. As for that iris, what an exquisite surprise! It was a surprise Lis. I’ll be hoping for more later in the year. That leucodendron is stunning! And your roses. Do they take a lot of looking after in the hot climate? Thanks, Ali. Roses do very well here. I think they like the climate and they flower for a long time. It’s pretty hard to upset a rose, isn’t it. I don’t have to do any more than the usual things: prune, feed, deadhead etc. The biggest issue, this year at least, has been water. Stunning iceberg roses. 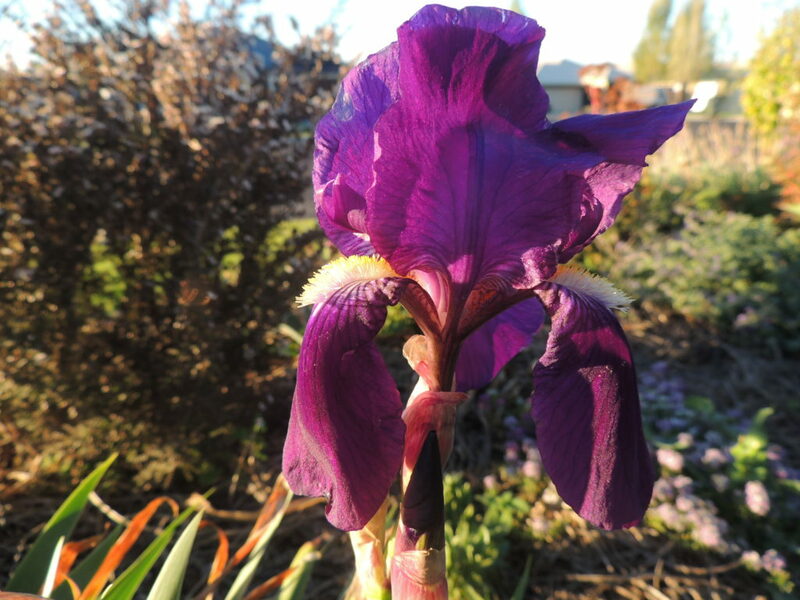 I have a very similar Iris which has flowered today on the other side of the world… weird. It is weird,Ciar, because although that is usually an early iris, it shouldn’t be as early as that! 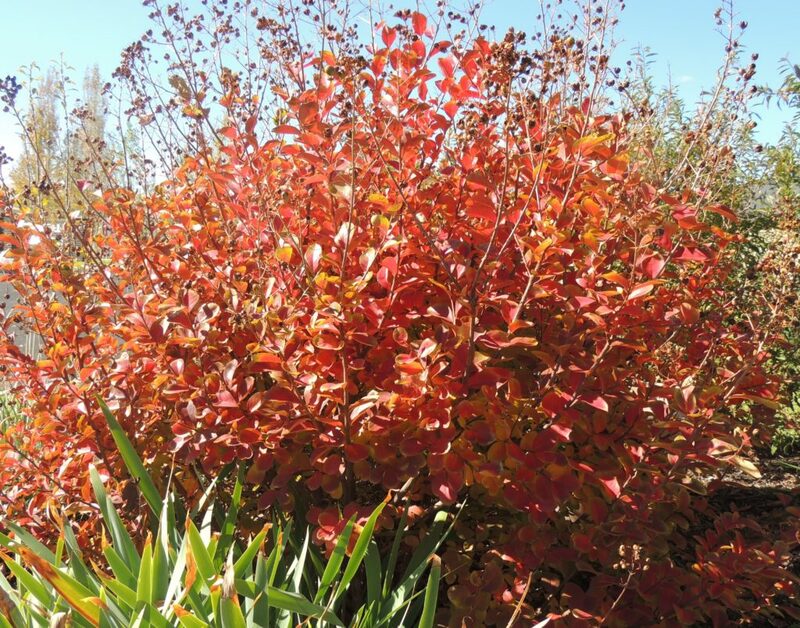 Nice to see some different angles of your garden; the view of the autumn foliage on the trees is lovely, a real invitation to explore the garden. Thanks, Christina, I’m looking forward to the time when those trees are bigger- the crepe myrtle is going to be lovely in a few years, and will also provide some much-needed dappled shade in the summer. That’s my plan, anyway. What a wonderful garden. Looks like there are lovely nooks and crannies to enjoy. Beautiful autumn colors. Thank you, Christine. We’re having a very colourful autumn this year, I think perhaps because it’s been so dry. I don’t know about you, but I always feel a great sense of relief when autumn rolls around. Summers here are way to hot and dry for my liking. Can’t even imagine how they are in your part of the world… yikes! Anna, I really dislike cold, so winter is the season I like least. Summers here can be very hot but because we are inland, we rarely have humidity, so even 40 degrees isn’t too awful. You need to be in the shade though. I wouldn’t be out gardening except in the very early morning. Our biggest problem here is lack of rain. How wonderful to be able to grow leucodendron, it’s fabulous. The crepe myrtle looks wonderful against the blue sky. Thank you Chloris. The leucodendron is so undemanding I should plant some more. I love all six. 🙂 I’m not growing Iceberg here, but we were lucky to have an established bush during a brief sojourn in California some five years ago. So reliable and abundant! And pretty! If you do plant your bays out, I would love to know the results. I have just managed to kill one in its nursery pot before getting it planted anywhere. I need another, but not sure whether to keep it in a pot or put it in the ground! Several people warned me not to plant the bays in the ground, Amy, so I contacted the people at the nursery where the idea to do this originated. They said they don’t have any trouble with theirs, so I’m still going to do it. I’m sure I’ll be posting a photo before too long! 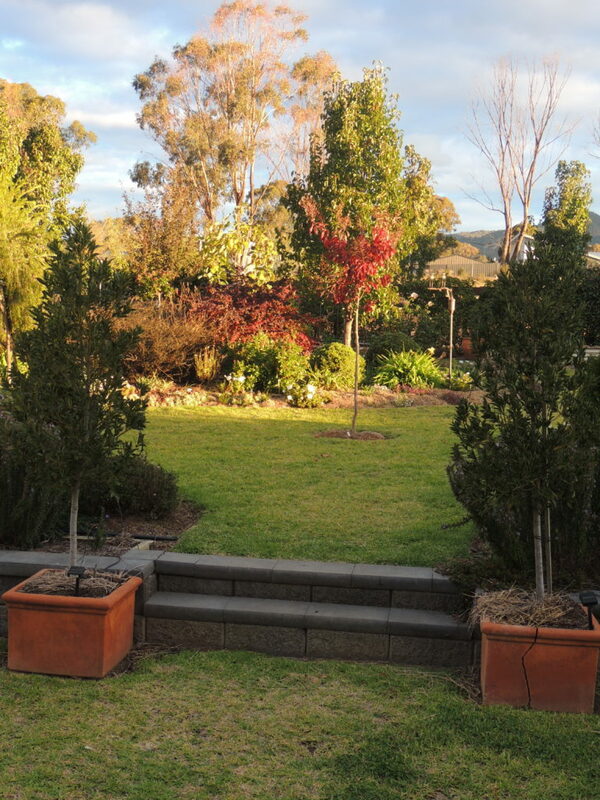 Our bay trees are enormous, well over 6 metres, and were here when we moved in about seven years ago. They are all getting ready to flower in a few weeks time. They are really a kind of dense hedge that completely hides the next door property. Yet, they tolerate a huge number of different plants underneath and form a protective umbrella shading them form too much sun. Well, time will tell with ours. They certianly can’t stay in those pots any longer.